European Union officials have said they will respond "firmly" if US President Donald Trump presses ahead with his plan for steep global duties on metals. World Trade Organization Director General Roberto Azevedo said: "A trade war is in no one's interests." The rhetoric ramped up as Mr Trump tweeted that "trade wars are good". 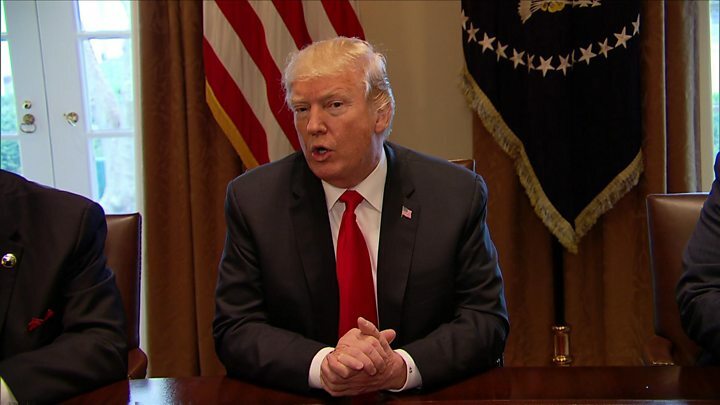 International condemnation has greeted the US president's Thursday announcement that he plans to impose a 25% tariff on steel imports and 10% on aluminium next week. What are EU officials saying? The European Union is reported to be considering retaliatory tariffs, targeting US steel, agriculture and other products. Speaking to a German TV programme, he vowed: "We will put tariffs on Harley-Davidson, on bourbon and on blue jeans - Levi's." French economy minister Bruno Le Maire said there would "only be losers" in a US-EU trade war. Mr Le Maire vowed a "strong, co-ordinated and united response from the EU". What does Trump administration say? Mr Trump tweeted on Friday morning that the US was "losing billions of dollars on trade" and would find a trade war "easy to win". Critics argue that the tariffs would fail to protect American jobs and ultimately raise prices for consumers. But US Commerce Secretary Wilbur Ross used a can of Campbell's Soup to defend the tariffs on Friday morning as "no big deal". He told CNBC the duties would have a negligible effect on the price of a tin, amounting to less than a cent. "Who in the world is going to be too bothered?" he said. Canada, Mexico, China, Japan and Brazil also say they are considering retaliatory steps. The prime minister of Canada - which exports more steel to the US than any other country - slammed the tariffs as "absolutely unacceptable". Justin Trudeau told reporters in Ontario he is "confident we're going to continue to be able to defend Canadian industry". A Chinese foreign ministry spokesman said: "If all countries followed the example of the United States, [it] will undoubtedly result in a serious impact on the international trade order." The International Monetary Fund (IMF) said Mr Trump's restrictions "are likely to cause damage not only outside the US, but also to the US economy itself". Kosei Shindo, chairman of the Japan Iron and Steel Federation said that the move "will create a negative chain reaction affecting not only steel but also other products considered to have national security implications". Many US companies also expressed alarm, including beer brewers, which use aluminium for canned beverages. Anheuser-Busch InBev NV, the world's largest beer maker, warned that Mr Trump's plan is "going to put jobs at risk and would be against the US consumer". What are the stakes for US? Mr Trump has lamented the decline of the US steel industry, which since 2000 has seen production drop from 112m tons to 86.5m tons in 2016. The number of employees working in the sector has fallen over the same period from 135,000 to 83,600. But experts say far more Americans work in industries that depend on steel products, than are employed in steel plants. 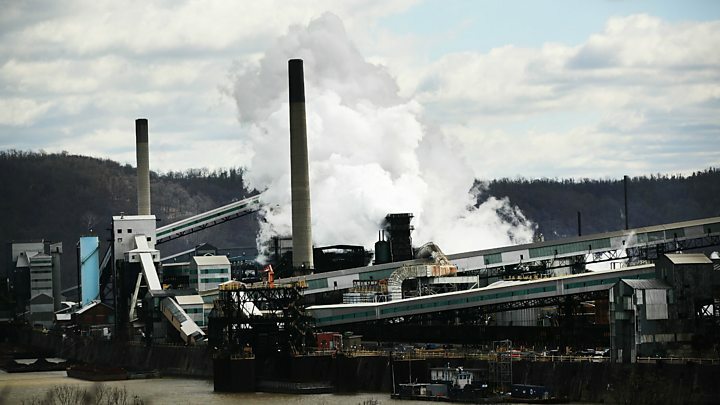 Steel mills in 2015 employed about 140,000 Americans, according to census data. But 6.5 million Americans work for manufacturers who make things using steel.